Q&A with Ulrike Passe, co-author of "Designing Spaces for Natural Ventilation"
Ulrike Passe, co-author of Designing Spaces for Natural Ventilation, discusses some of the misconceptions of natural ventilation and current trends in the field. Why did Designing Spaces for Natural Ventilation need to be written? Natural Ventilation is a key design strategy for sustainable buildings. While a growing number of contemporary architects desire the integration of natural ventilation flows into architectural design concepts, the evaluation and prediction of natural air movement and related energy performance are still difficult to accomplish due to the complexity of the underlying physics. We perceived an apparent gap between engineering knowledge of natural ventilation and its implementation into spatial design strategies by architects. The book is the first step to close this gap. This is the first design guide on natural ventilation for architects, at least the first complete book dedicated to natural ventilation and written for architects. Quite a few environmental forces books like Sun, Light, Wind of course discuss natural ventilation, but they do not go much beyond basic rules of thumbs. Then, there are quite a few recent books on current mechanical and natural ventilation available for engineers, discussing current engineering research, but no really in-depth guidelines actually exist for designing architects. Existing literature communicates in a very technical manner and contains mathematical formulae many architects are ill equipped to incorporate for lack of knowledge, patience, or time. Although integrative design is on the rise and the first sketch, which sites the building in the urban context or landscape, determines the success of the design for natural ventilation, very little guidance is available to do this beyond looking at prevailing wind directions. Natural ventilation is a design issue, it requires spatial thinking and architectural understanding. Natural Ventilation cannot only be discussed in HVAC classes or Environmental Controls courses alone, it has to be intrinsically embedded in the Design of the building and cannot be added at a later stage. When used properly, natural ventilation can provide a large amount of the required energy for free, without harm to climate and atmosphere. Naturally ventilated buildings need to be designed, operated, and controlled differently than mechanically ventilated buildings. 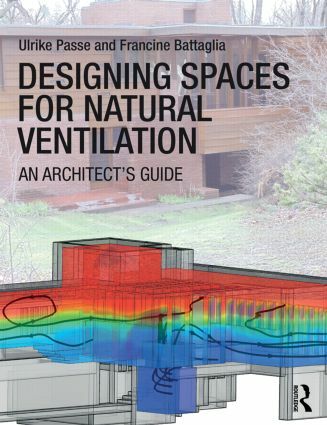 The book discusses and illustrates many proportional relationships useful to understand natural ventilation and to apply to design projects. While building envelope characteristics are important, the space of the building, multiple connections and networks of spaces are the key parameter for a well-designed naturally ventilated building. What are some of the misconceptions of Natural Ventilation? Actually quite a few misconceptions exist related to natural ventilation. While a lot about natural ventilation is about ‘opening windows’ that in and of itself is often not sufficient. Especially in urban context or warmer climates, the most successful natural ventilation strategies often include some component of stack ventilation, but stack ventilation specifically requires spatial composition strategies, which are not commonly used amongst architects, for example the position of the ‘neutral plane’ and the raising of the top outlet way beyond the upper floors, so that the hot air rising does not flow out through the upper spaces, which then just get too hot and receive occupants complain. Another misconception is that opening windows always helps to cool a space. There are obviously moments during the summer season and on a hot summer day, when one should not open a window. Many climates require a fairly intricate operation and control schedule. For example the Harm A. Weber Academic Center at Judson University in Elgin Illinois, one of the cases studied in the book has at least 15 different control strategies, but can be naturally ventilated in the challenging climate of Chicago for about 60% of the year. The effect of night time cooling is often under-utilized. For example here in Iowa I have once heard from an engineer, that Iowa has only two seasons: heating or cooling, but when you look in more detail at the Iowa climate, there are about 4 to 5 months where natural ventilation can easily be achieved with the addition of thermal mass for night time cooling and properly positioned windows and doors as well as well insulated envelopes. We are currently studying these strategies with our 2009 entry into the US DOE Solar Decathlon, the Interlock House. Computational Fluid dynamics simulations are improving the understanding of natural ventilation predictions and novel expertise in CFD will soon enable more precise design predications. In addition an improved knowledge of the near building environmentl the microclimate and urban wind patterns are current research topics,which will advance the field of natural ventilation. A team at the Center for Building Energy Research (CBER) at Iowa State University is currently working on the validation of CFD models with measured data in our Iowa test bed. The complexity of thermodynamics has been a major challenge in the prediction of natural ventilation. The interaction of natural ventilation flow with thermal heat transfer properties in solid materials is computationally very intensive and thus not well integrated into engineering and design prediction tools yet at all. Air velocity and thermal capacity of materials are difficult to simulate in one equation system, and turbulences in larger spaces cannot be predicted with certainty. But turbulence is the basis for the mixing of air and thus for good natural ventilation It is very complex in computational fluid dynamics (CFD) to model flows between solid materials and air currents[i] and further research into architectural design and fluid dynamics is needed. What experience led you to write this book? The concept for the research started in my own architecture practice in Berlin, Germany. My partner Thomas Kaelber and I were designing House Marxen[ii] a single family home actually with my father as the client. We designed the house in the 2000/-01 with spatially interconnected volumes to support the air flow to such a degree that the temperature was kept within an acceptable range. In this approach, architecture serves as a passive-energy device. Anecdotal information confirmed that natural ventilation flows in this house support the cooling and heating of the building. Yet, at the time of design and construction, there were no easily accessible design tools to quantify the spatial effect on this flow. This structure is overlaid by a spatial composition using volumetric proportions of the Fibonacci sequence, which connects rhythms and sequences of space on three different levels, opening up spatial connections for vision, movement as intuitively predicted by the architect and experienced by the user during the occupancy over the last 10 years. This sparked the decision to embark on a ten-year journey to reveal the hidden physics of natural ventilation to the designing architect. I teamed up with Francine Battaglia and expert in computational fluid dynamics to address this challenge. What suggestions would you make for change, future research or interventions? The next big challenge for sustainable design strategies is the adaptation of passive design strategies like natural ventilation to climate change and further research is needed regarding the near building environment as well as buildings adaptability to future climate scenarios. New technologies for opening and control mechanisms for occupant interaction need to be developed, much in the same way as dynamic shading strategies. And beyond the concepts and strategies laid out in great detail in the book, we need more refined design tools. A lot has already been achieved over the past 10 years and new computational design tools are more readily available. We at Iowa State University are currently working at a design plug-in for natural ventilation, but that is still in its infancy. [i]Preston Stoakes, Ulrike Passe, and Francine Battaglia, "Predicting Natural Ventilation Flows in Whole Buildings. Part 1: The Viipuri Library," Building Simulation 4, no. 3 (2011). [ii] Ulrike Passe, Thomas Kaelber: 'Casa a Marxen', In 'l' architettura naturale', international review on sustainable architecture; year IX no 30, March 2006, Edicom Edizione, Milano, p. 62 – 65.